Wes Miller was named head coach of the Spartan men’s basketball team March 6 – a week after being named the media’s SoCon Coach of the Year. He had been named interim head coach on Dec. 13. After six losses, the team began to catch fire, winning 10 of their next 11 contests, their play characterized by aggressive defense and great passing. Most of the games went down to the wire. The students began to cheer: “I believe that we will win!” And signs such as “Miller for President” and “Don’t mess with the Hoff” – referencing big-man Taylor Hoffer – dotted the student section as well. On his 29th birthday, the students sang “Happy Birthday” to Miller from the stands. After that win, Miller and the players stressed the sense of team – from managers to top scorers. Everyone had each other’s backs. After one exciting overtime victory, dozens of students stormed the court at the buzzer. The excitement and the buzz were contagious. The Spartans’ leading scorer, Trevis Simpson, commented at the time: the chants and the cheering were making a difference. They ultimately won the SoCon North Division outright – the first time the men’s team had done that. Two days after the end of their season, a news conference was held at the Greensboro Coliseum. The announcement: The head coach moving forward will be Wes Miller. Three seniors are set to graduate: Aloysius Henry, Aaron Brackett and Elhanan Bone. Sophomore Trevis Simpson, named first-team All-SoCon, returns. Third-team All-SoCon Derrell Armstrong, a junior, returns. 85 percent of their scoring will be back. The players will hit the training rooms and weight rooms. Wes Miller will hit the recruiting trail. That means dancing. We want to dance. 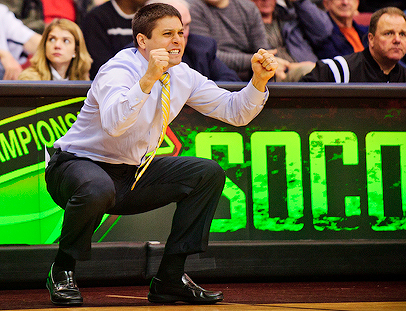 See UNCG Athletics’ complete story on the coaching announcement, plus the “Our Greensboro. Our team. Our coach.” web page.